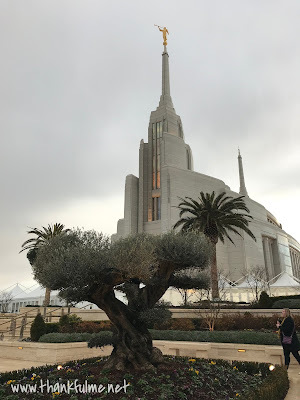 Photo: A gnarled old olive tree grows in a bed in the plaza of the Rome Italy Temple. Two palm trees are in the background,on either side of the front of the temple. As we made our way to the temple's visitor's center, the white marble statue of the Christus, with arms outstretched, beckoning us, could be seen through the floor-to-ceiling windows. The reflection of the temple framed the statue perfectly. 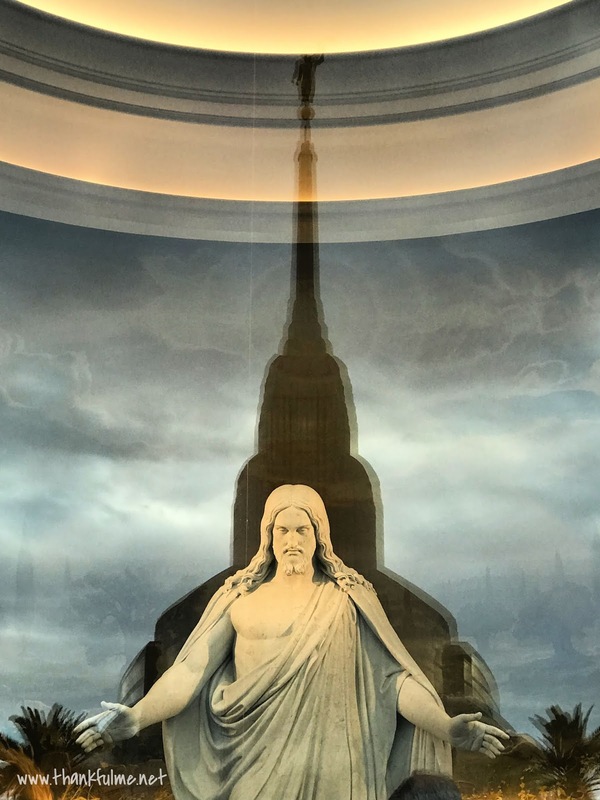 Photo: The reflection of the Rome Italy Temple appears perfectly centered behind the white marble statue of Jesus Christ. 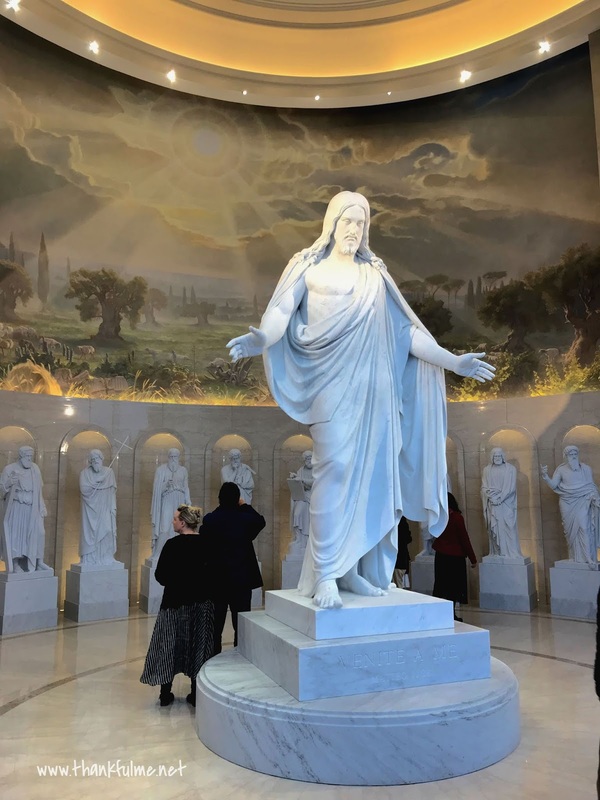 Inside the visitor's center, the Christus statue stood in front of a huge mural of the Italian countryside, while statues of the twelve apostles (with Paul replacing Judas Iscariot) formed an arc behind Jesus. The Christus and the statues of the twelve apostles are replicas of the originals by Bertel Thorvaldsen. The Church of Jesus Christ of Latter-day Saints was given permission from officials from The Church of Our Lady, in Copenhagen, where the originals are located, to digitally map each statue for re-creation. 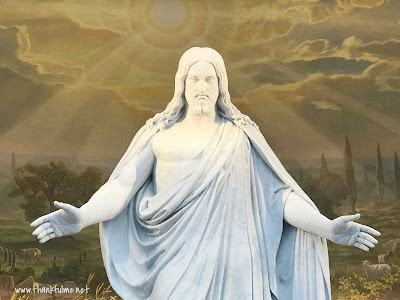 Photo: The statue of the resurrected Jesus Christ, with arms outstretched, stands on a pedestal. Behind him is a mural showing the sun shining down on the Italian countryside, and white marble statues of the original twelve apostles (with Paul replacing Judas Iscariot). Photo: The white marble Christus statue. The angle at which the sun in the mural in the background shines its rays down on the earth is the same angle as Christ's arms are outstretched. Two days ago, on Sunday evening, we were able to attend a fireside at which the mural's artist, Joseph Brickey, spoke. (Thanks to our friends, Leslie and Eric, for the invite!) As he explained the religious symbolism and mathematical ratios employed by the classic masters of art, I gained a deeper appreciation for the thought that goes into painting. In the concluding minutes of his talk, he shared some of the symbolism in his mural. Before I share some of his thoughts, here is a time-lapse video of the painting of the mural. It was painted in Utah in an upper and lower flat panel, then rolled up, transported, and assembled on the curved wall in Rome. 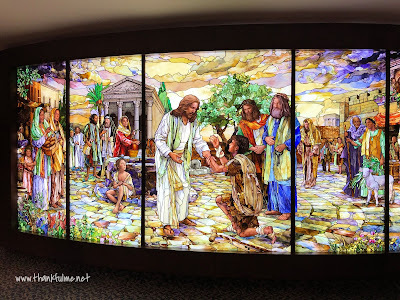 Rome LDS Temple Visitor Center Mural from Steven McCurdy@StoryCollectors on Vimeo. I loved hearing about the symbolism behind the painting. The sun and its rays represent Christ's love for the people on earth. The twelve olive trees were painted so that each tree would stand above a statue of an apostle. There are exactly forty sheep in the mural, the number forty representing completion. Probably my favorite insight into the painting, though, was about a ram, one of the forty sheep. I wish I had a photo of the ram, but I don't. The ram is caught in a thicket, just like the ram that Abraham offered in place of Isaac. The ram is placed on the mural in such a way that when you stand in front of the Christus statue, the ram is covered up by Christ's hand, symbolizing the fact that Christ's sacrifice ended animal sacrifice, and that the ram that Abraham offered was a foreshadowing of Christ. Just as the ram pointed us to Christ, so, too, does everything in the temple and visitor's center. As we entered further into the visitor's center, a beautiful stained glass wall depicted the various scenes from the ministry of Jesus. Though we did not feel rushed, all too soon, it was time to leave. As we walked to the bus, storm clouds were gathering and the sun was setting. 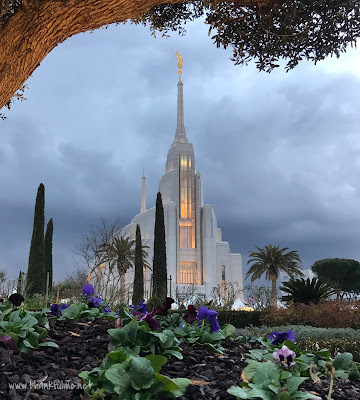 Looking back toward the temple, the contrast between the light and the darkness was striking, and I was reminded of what a beacon of light the temple is in this often dark world. Photo: Light shines from within the Rome Italy Temple, and the gold Angel Moroni stands on top of the spire against dark clouds. Two palm trees stand on either side of the temple. 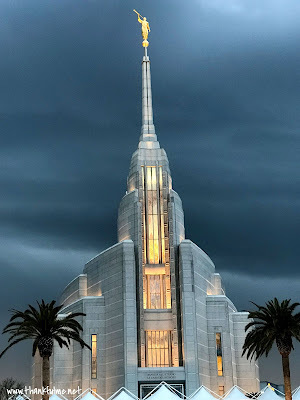 I'm thankful for temples, and for the reminder they are of Jesus Christ, the true Light. It certainly is a lovely masterwork of craftsmanship and art! One thing that I really like about the craftsmanship and art of the temples is that the designers try to incorporate local nature into the elements. The video tour was really interesting! Gorgeous building! And I really love that last photo with the dark clouds behind the temple. Oh, I'm glad you watched it! It really does a great job explaining and showing the inside of the temple, step-by-step.